Inder Loves Folk Art: Happy Easter! Happy Easter! I know it has been a couple weeks since Easter (unless you're on the Orthodox calendar, in which case Easter was just this past Sunday) but I'm just now getting around to sharing pictures of my kids in their handmades on Easter. 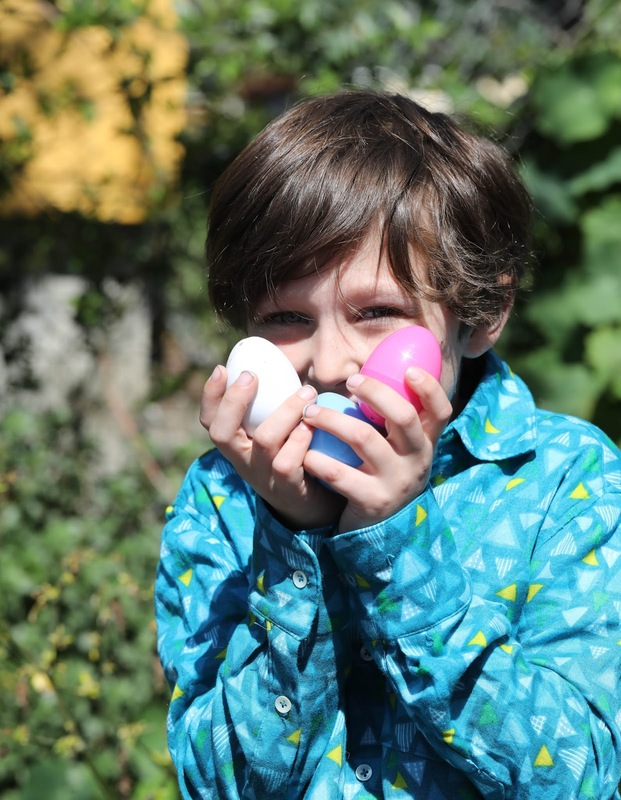 We kept things pretty quiet this year - we went to church, then we had a little Easter "egg" (plastic, filled with candy) hunt in the back yard. 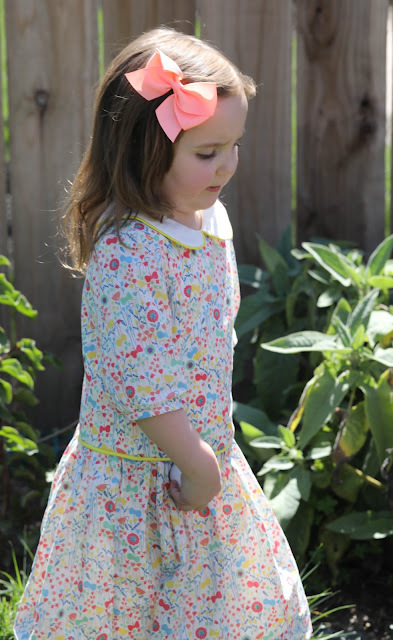 A couple weekends before Easter, I decided I wanted to make Maggie a dress for the occasion using some of the fabric I've stashed for her. I picked out a Robert Kaufman London Calling lawn, "Flower Buds in Sorbet," which I had about two yards of, and started planning. Such fun! I had a pile of gorgeous yellow vintage notions that were gifted to me by a dear friend last Christmas, which worked perfectly with this print, and I felt like this lovely pastel floral fabric wanted to be made into a pretty little dress reminiscent of dresses of the 20s and 30s with a piped white peter pan collar and low waist. I also felt like it should have sleeves, since the weather at that time was still pretty gloomy. Unfortunately, I do not own any patterns that fit this criteria ... or do I? I broke out my Oliver + S Building Block Dress book and got to work! The Building Block Dress gives you a basic dress pattern (which is super well drafted and fits perfectly in its own right) for a dress with a natural waist, peter pan collar, short sleeves, and an a-line skirt. 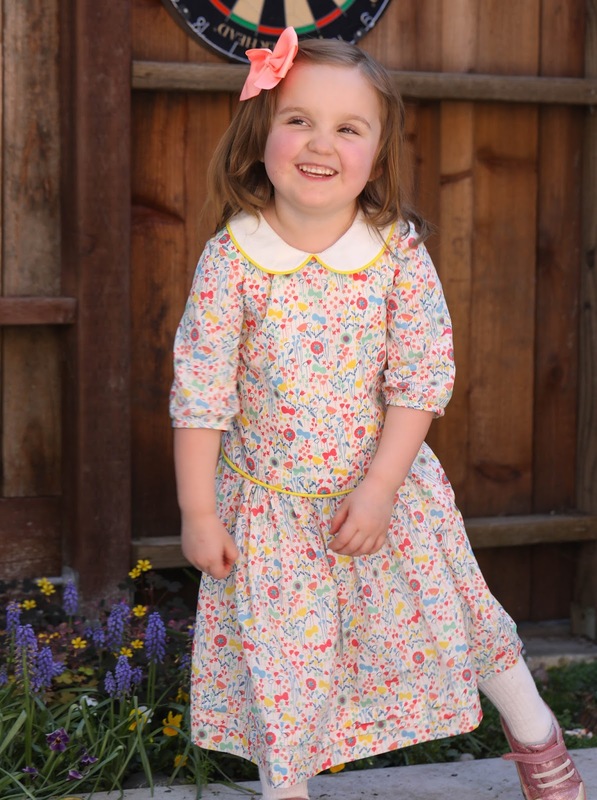 The book also provides instructions for variations on the pattern, which allows you to make practically any dress you can imagine. So cool, right? So cool. And here we are! For anyone keeping track, I added length (and flared out) the bodice and added long sleeves (bell sleeves, shortened to elbow length and gathered slightly into bias binding), as well as a gathered skirt with some growth pleats. I sewed yellow piping into the collar and the waistband. 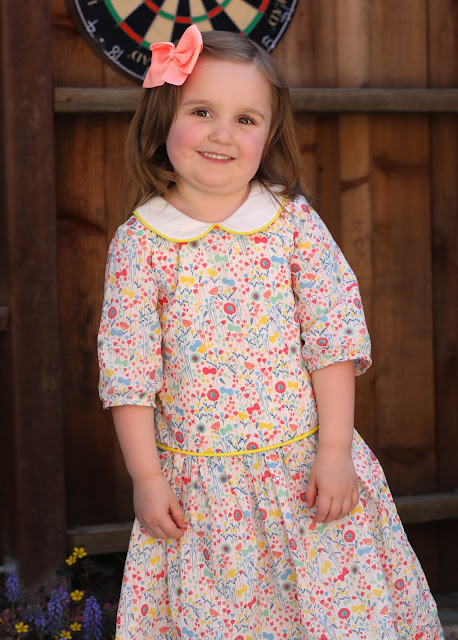 If you're really keeping track, the bodice is lined with a soft cream cotton, matching the collar. 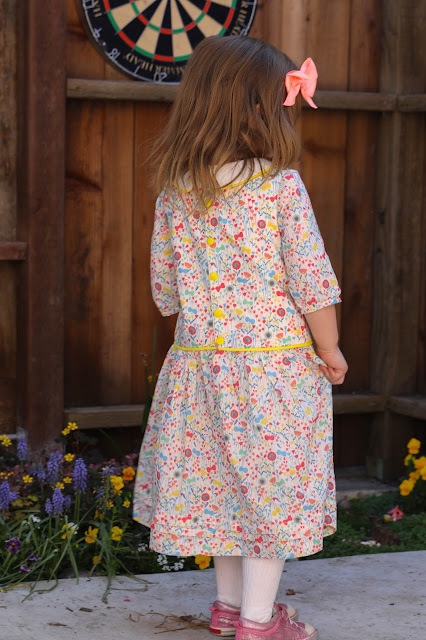 The back is closed with five yellow buttons, and there is a very small placket beneath to help Maggie get dressed easily. This was a slightly fiddly but mostly enjoyable sew. The piping at the collar needed coaxing (ahem, my trusty mallet) to keep it flat, and I didn't have time to handsew the bodice, so the inside of the dress could be nicer. In my mind, the bell sleeves were going to end up a bit more gathered and poofy than they turned out in real life. 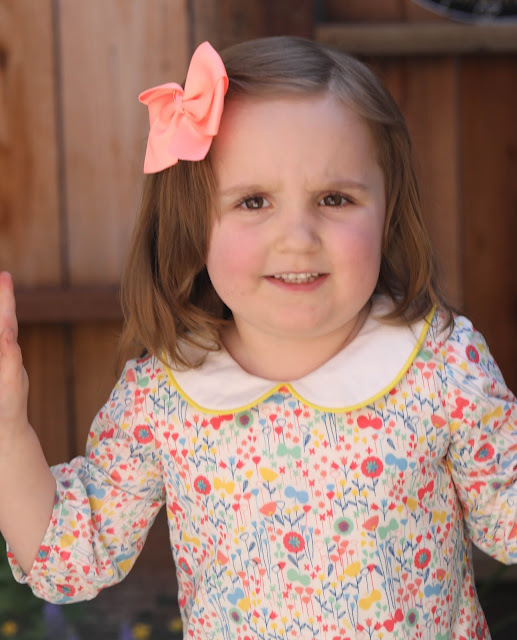 But when I put the completed dress on Maggie, it was like, "Ahhhhhhhhh." Essence of vintage childhood here! She was a vision on Easter. 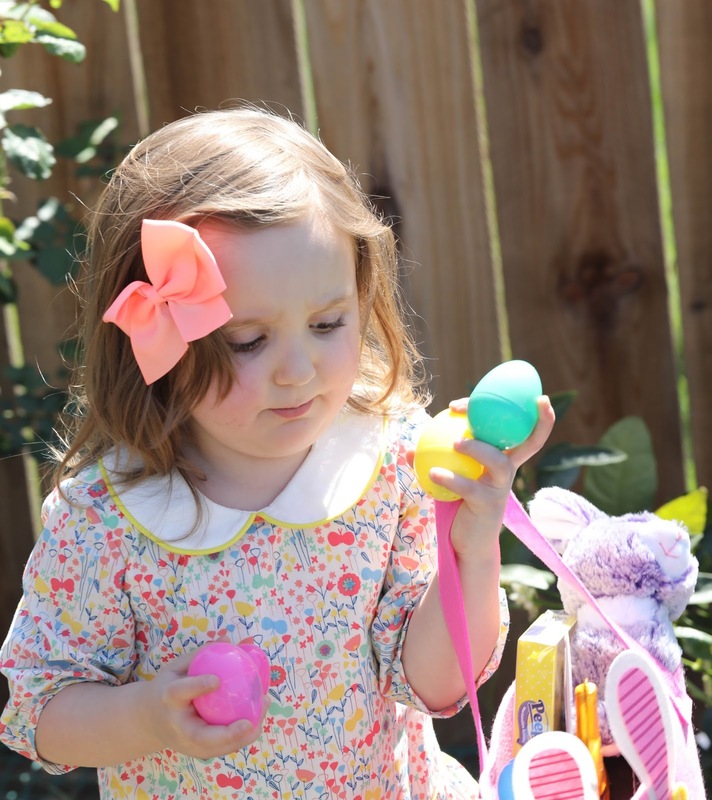 While looking absolutely adorable, Maggie was very serious in her egg-hunting, trying to beat her brother to every last egg if possible. Her brother, thank goodness, was more chill, allowing Maggie to get more than her share without much complaint (if anything, he was pointing out eggs to her! at which point she would swoop them up and try to grab even more, reducing her brother's share, cue eyerolls). But he's a good sport. 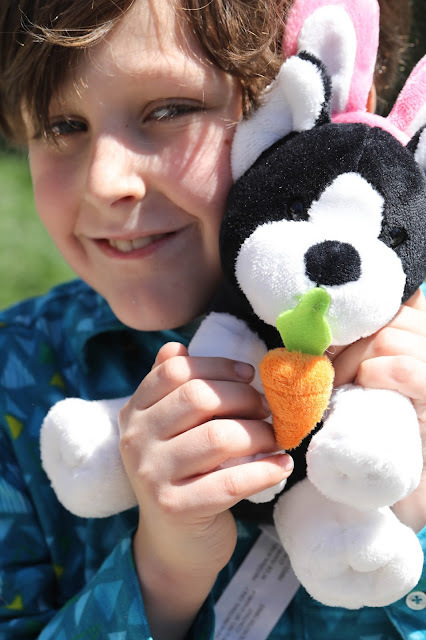 He was most pleased with the little puppy with bunny ears that came with his Easter basket. He wore his Buttoned Up Button Down shirt, which I made for him last year, for at least two hours, so we could go to church. He insisted on wearing it with sweatpants and took it off as soon as he could, but he did wear the shirt, and that's all I asked, right? He's not a huge fan of "nice" clothes. Although it would be wrong to say his sister's competitiveness never gets on Joe's nerves, more often than not, he handles it with a little shrug and sweet generosity. He is able to remember, better than I am at times, that she's still a bit younger and we can't always expect her to stay cool under pressure. Also, candy is yummy, but you only need so much (we totally hid most of Maggie's!). He's such a sweet kid. And when she's not trying to rob him of candy, she's a loving and sweet little sister. 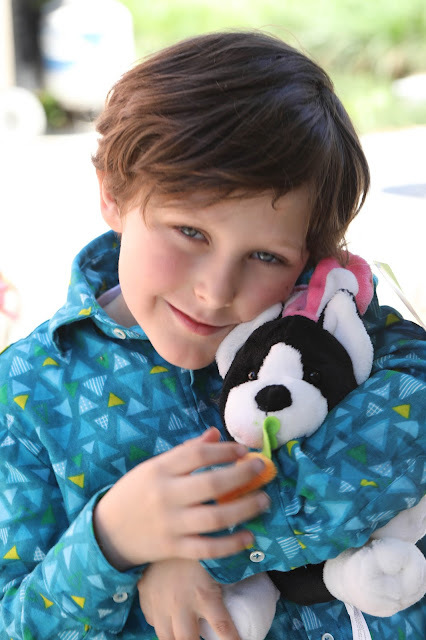 Did you sew for your kids this Easter? Are you making spring clothes? What are you sewing this season? Oh that whole scenario sounds so familiar, only mine are older now and make far less concessions for each other. It's rough!! This and your previous post are making me wish I had more time and granddaughters!! Love your style.